This close read activity focuses on excerpts from the first chapter of Dry. 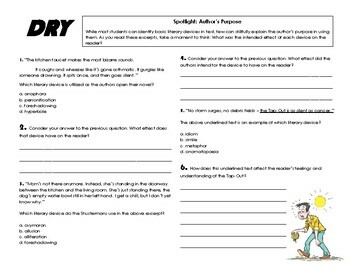 It provides opportunities for students to identify literary devices in text and analyze their effect on the reader. *** All of my close read activities not only ask students to identify or define elements, but they require students to analyze the How and Why of the text! In this exercise, students analyze the effect of literary devices on the reader. The three spotlighted excerpts include personification, foreshadowing, and simile. identify personification within a text. analyze the effect of personification on the reader. identify foreshadowing within a text. analyze the effect of foreshadowing on the reader. identify simile within a text. analyze the effect of the simile on the reader's feelings and understanding. 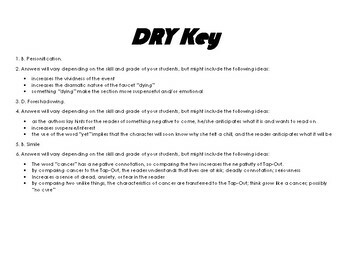 * A key is provided with correct answers for the identifications, as well as possible analysis responses. This higher level analysis increases rigor, student achievement, and the ability to make connections beyond the text. Thank you so much for downloading this resource, and I hope you find it valuable in growing your students! I'm a newer seller to TPT. Follow me if you'd like more resources like this. I'll be uploading novel and skill units soon!